The iconic story of IT, is getting revamped for the big screen. 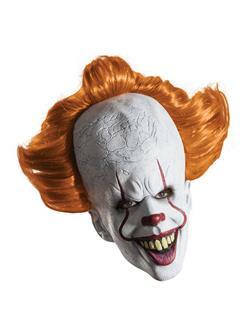 Straight from the new movie, the Adult IT Mask is a perfect way to scare your friends this Halloween. Pennywise is back at it, terrifying the children of Derry after 27 years. This latex mask is easy to wear all night. Detailed to look like a terrifying clown, the shocking orange hair, ghastly white skin, and blood red makeup will make your skin crawl. Right in time for Halloween, order your IT mask online.